Digital First Media is notorious for gutting newsrooms across the country to turn a profit for its hedge-fund owners. It has censored journalists’ work and fired reporters who criticize their ruthless tactics — which are designed to pad the bottom line. When private-equity groups buy newspapers, they slash jobs, turn newsrooms into shells of their former selves and spend profits on anything BUT journalism. This isn’t just bad for newsrooms: It also spells doom for millions of people around the country who rely on their local newspapers to find out what’s happening. When local news disappears, fewer people participate in their communities. Support your newsrooms and the communities they serve. Don’t sell to Digital First Media. The owners of Digital First Media have been called “vulture capitalists” by journalists in their own newsrooms.2 The company has censored journalists’ work and fired reporters who3 criticize their ruthless tactics — which are designed to pad the bottom line. And while Gannett itself has a questionable track record when it comes to investing in news, if the company sells to Digital First it will decimate news coverage in thousands of communities. 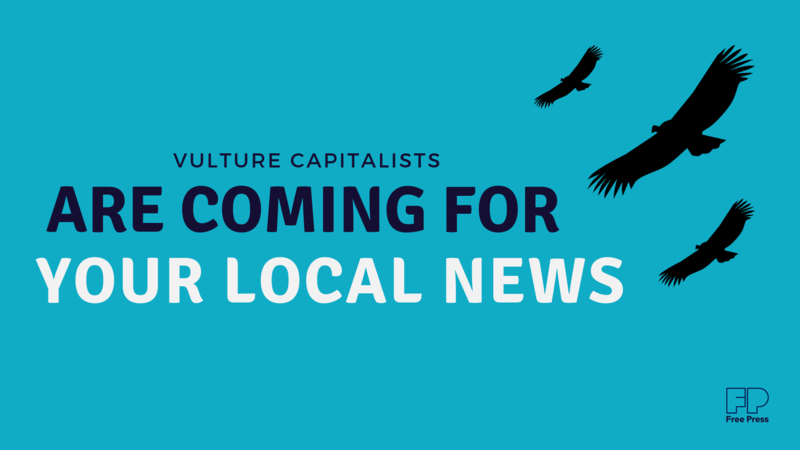 Shareholders will pressure Gannett’s board to let the vultures in the door. We can’t let that happen. Tell Gannett to support communities around the country by protecting local news.